Polio Dynamics | Micaela E Martinez, Ph.D.
Childhood infections killed over 3 million children in 2012 alone. Although vaccines exist for many childhood infections, outbreaks of diseases such as polio, measles, and pertussis remain a problem (here is an interactive map of recent vaccine-preventable outbreaks). 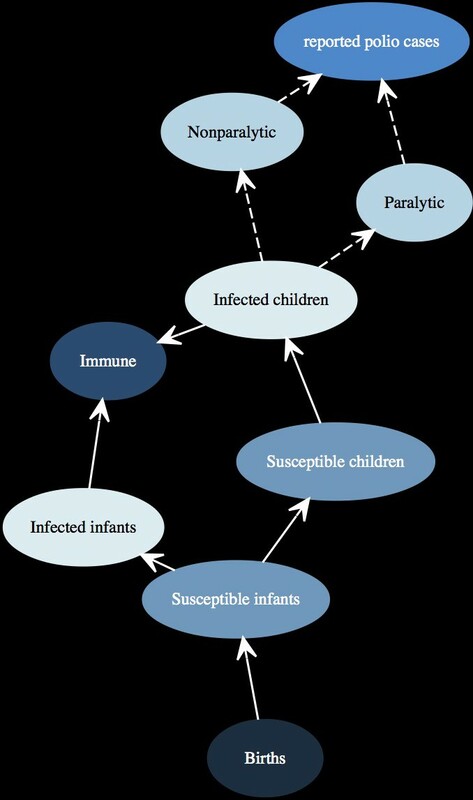 One feature common among all childhood infectious diseases is seasonality of epidemics. 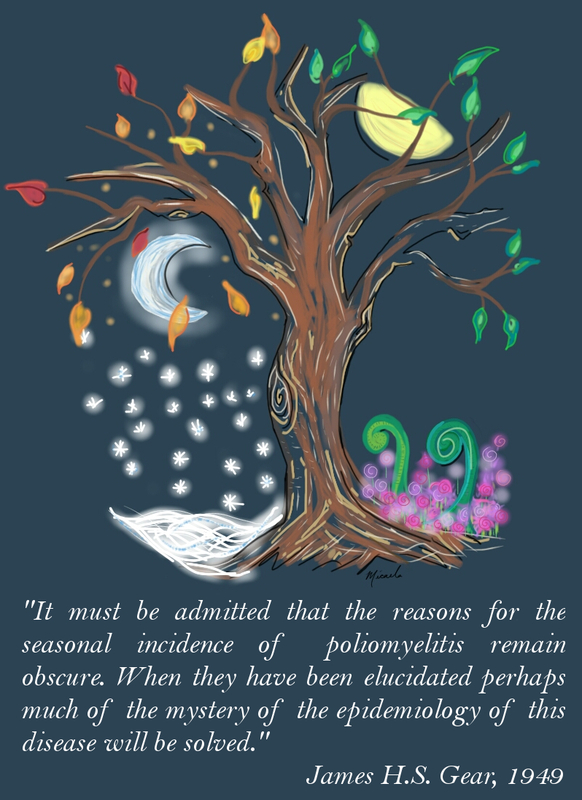 With a couple notable exceptions, the underlying mechanisms driving the seasonality of childhood diseases are unknown. The bulk of my [Micaela’s] dissertation focuses on using poliomyelitis as a study system to empirically investigate how seasonal transmission, changes in human demography, and silently transmitted infections interact to shape epidemics. Polio is an ideal system to answer these questions due to extensive records of polio cases in the US going back to the early 1900s. In 2015 published my dissertation work on the ecology of polio in the journal PLoS Biology. My paper and all of the data are available by clicking on the article image below “Unraveling the Transmission Ecology of Polio”. My studies of polio transmission draw upon large historical datasets containing information regarding polio outbreaks and population demography. The study published in PLoS Biology is focused on poliovirus transmission before the polio vaccines were developed. I have a study currently underway in which I am estimating the effects of the polio vaccines (IPV and OPV) on transmission by using data from the 1950s and the 1960s in the US and the USSR, the countries that held the IPV and OPV vaccine trials, respectively. Polio transmission model schematic. I use Susceptible-Infected-Recovered (SIR) models to track polio infections through populations. In the pre-vaccine era, polio infections typically occurred in infants and children, with individuals over 6 months old being susceptible to paralytic and non-paralytic polio. When to Sign Polio’s Death Certificate: It’s not over just because there aren’t any more new cases, a new study shows. Pacific Standard. How to Wipe out Polio and Prevent its Re-Emergence. Michigan News. Complicated Twists in Fight to Eradicate Polio. Inside Science. Art by Micaela Martinez. Quote from JHS Gear (1949). The Virus of Poliomyelitis: Its Distribution and Methods of Spread. Journal of the Royal Sanitary Institute.